→Cuisinart Cookware Review – Should I Buy ? Nonstick cookware is incredibly popular today. This is for many reasons. It is easy to cook with, takes hardly any time to clean up after use, and today is more affordable than ever before. With so many different brands of nonstick cookware, it can be difficult to know what cookware set is best to suit your individual needs. Below we will review the latest nonstick cookware set from Cuisinart, which features 17 pieces of cookware and several accessories. Here you will have every pot and pan to prepare fabulous meals for your family. 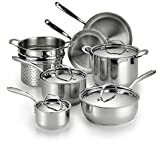 The following are the most features of Cuisinart 66-17 Chef’s Classic Nonstick Hard-Anodized 17-Piece Cookware Set. The metal construction of this cookware set is incredibly durable and hard wearing. It is made from anodized aluminium. This also ensures that the pan is perfectly safe in which to cook and prepare your food for your family, as it contains no toxins or other harmful chemicals. The aluminium construction encases the entire pan and includes a sturdy core. Cooking food with anodized aluminium ensures that food is thoroughly cooked and that there will be no hidden hotspots of food. Food will also cook that much quicker. This cookware set features revolutionary nonstick technology, in the form of an internal layer of titanium. This means that while cooking your food, it will not stick to the base of the pan and burn. Being nonstick, also means that you will require no, or very little cooking oil, in which to cook your food. The pan will heat to your desired temperature and food will cook in its own juices, creating a healthier way in which to cook and eat your food. All of the handles within this cookware set are made from cast iron and are riveted to provide extra stability and safety while coking. Ergonomically designed, they are easy to grip and are extra long so that hands stay at arms length while manipulating the pots on the stove. Handles also stay cool to the touch when used on the stove. Handles are completely safe to use on temperatures up to 500 degrees F.
All of the pans have a designated glass tempered lid. The glass is extremely safe and can withstand temperatures of up to 500 degrees F. They can also be placed in the dishwasher. Each lid features a high loped handle that will stay cool, so you will not burn you hand while removing the hot lid. Each lid fits perfectly, ensuring that no nutrients are lost during the coking process. Having secure lids also helps to speed up the cooking process, as food is heated that much quicker, as no steam is lost. Q. Can the cookware be used on glass or ceramic cooker tops? A. Yes they are perfectly safe to use. Q. Is the cookware really dishwasher safe? 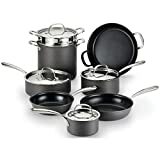 This 17 piece nonstick cookware set by Cuisinart is perfect for family cooking. It has everything you need to prepare daily meals. Washing up is made very easy with the nonstick surfaces and everything can be placed in the dishwasher. Food cooks fantastically well, and you will need less oil, resulting in healthier cooking methods. This set is fantastic value for money.